I love collagen. Just the word makes me smile. For those of you who do not know what collagen is, I will not get all scientific, but simply say that it is nature’s ultimate good skin must have. When you see babies and little children with firm, plushy, rosy cheeks – that is collagen. It is best to imagine collagen as little bubbles of glowing, plumping, wonderment under your skin. We are all born with a layer of collagen beneath the outer layer of our skin. As time goes on, the collagen wears and breaks down. Imagine every time you smile, every time you frown, every time your face is exposed to free radicals in the air all around us, stress is put on the collagen bubbles. With stress, they pop – and your face deflates. But do not fear! Help is at hand. there is a new drink on the Market called Collagen shots. Made from 100% natural marine collagen with acai berry added for an added boost of skin strengthening vitamins and anti oxidants, this drink is the ultimate good face food. I know there are many vitamin and mineral supplements available for healthy skin, but without collagen underneath, the outer dermis will sag. It may look glowing and strong, but only collagen has the power to plump. Collagen shots come in a powder form, which you mix with water or drink of your choice. The powder is perfectly palatable, and I have no problem in drinking it with water, but for an extra skin boost, I like to mix it with something good for digestion and high in anti oxidants. Both are key to glowing skin. 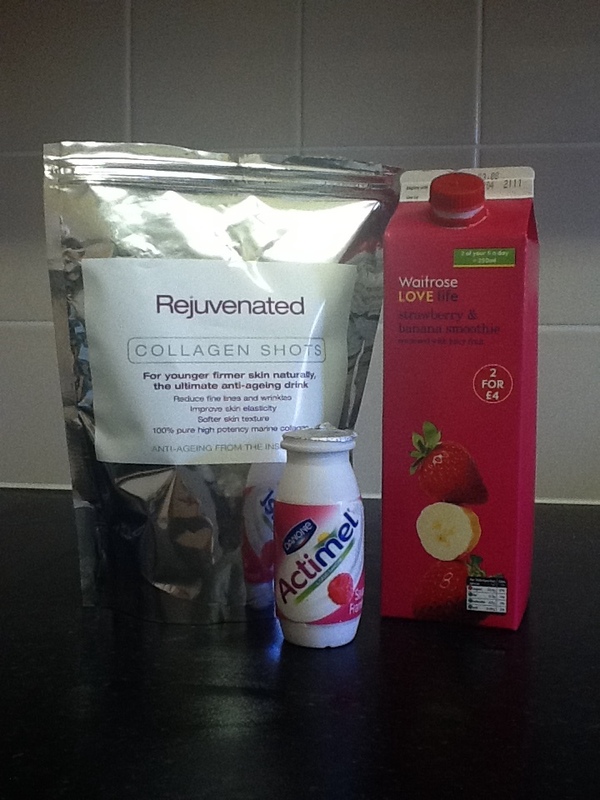 I apologise for the poor quality of the picture, but this is the ingredients for my favourite collagen cocktail. I put a pro biotic drink or a couple of spoons of pro biotic yoghurt in because healthy digestion is a major contributor to bright, healthy skin. Putting my collagen shots into a smoothies just makes me feel super healthy and quite virtuous. Collagen shots are an amazing product and a must have for anyone wanting full, soft and glowing skin from head to toe. You can buy Collagen shots online here and follow them on twitter @CollagenShots.